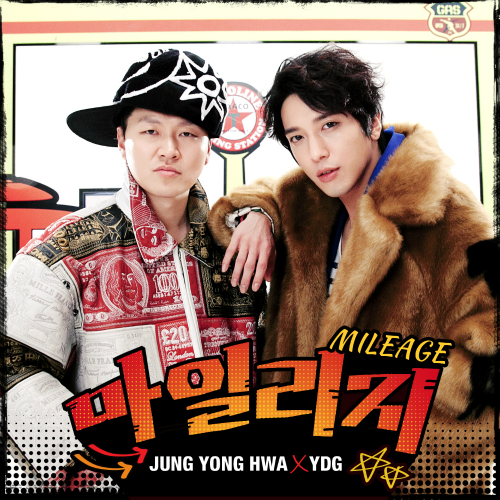 When I first heard of Mileage as the title of Jung Yonghwa’s collaboration with YDG, my first thought was: what kind of mileage is it? Airline mileage? What could the song be about? Will we be seeing JYH in a pilot uniform or something? Or as a traveler (I’m confusing this with his UnionPay commercial)? Of course by now, we all know how the MV looks like. It’s made of crack, and the music is something that I certainly did not expect but it was indeed a pleasant surprise exceeding expectations. Or maybe I’m just a sucker for crack and coupled with Yonghwa’s voice and good music, then I’m sold. I wanted to post about JYH’s solo album once it is out on the 20th but how can anyone resist Mileage? And if this is any indication on how the songs in his solo album would sound like, then we are in for a wonderful surprise. There’s no doubt that Yonghwa is one of the most talented musicians of his generation. I love the music he creates for CNBLUE as a band and I also am loving his music as a solo act (counting Because I Miss You and his for-the-fans song, Star, You; and now, Mileage). He did say that his first album would reflect his musical taste and if we are going by the music he chose for his DJ stint on Beat, then it covers a wide range from rock to hip-hop to ballad and pop, and everything in between. I don’t really like boxing musicians according to genres because that is so limiting and music is supposed to be all-encompassing and universal. And I disagree with the view that just because someone has a rocker image, he can’t do pop or ballads, otherwise he’d be thought of as going soft and mainstream. What does it matter the kind of music we do or listen to for as long as the message is carried across? I don’t even understand what the songs are about the first time I listen to my favorite artists, but we don’t listen to music because it’s about something that we can relate to, right? Rather, it’s because we can relate to the sound, regardless, that we open our arms–and ears–to it. And we fully embrace the song the moment we understand what it is about. So yeah, I’m so happy to see Yonghwa exploring the musical realm the way that he may be unable to as a member of CNBLUE. Besides, if he will sound like the vocalist of CNBLUE in his solo album, then what’s the point of coming up with a solo album? Not to say it should stop him from being Yonghwa, the leader of the band, but you get the drift. But there’s another surprise that I was in for–this album will be released digitally as opposed to actually dropping a physical album? Well, Mileage has been released as a digital single, and so was Star, You. I hope I just misread/misunderstood the information and that JYH would still be dropping a physical album too, aside from releasing it digitally. But I wonder how sustainable is this in the long-term for a musician like Yonghwa (and I hope that FNC is doing its job by registering the copyright to his songs). Copyright and piracy have been very hot topics and especially since last year when Taylor Swift left Spotify because she believes it’s bad for music economics. She argued that music is art and artists deserve to be paid for it. Her argument has since been debunked by Spotify founder Daniel Ek in a really interesting blog post. I’m a music consumer and I stream music and videos online, and download them too. But I also believe in contributing to the music economy, at least to those artists I support, because that’s one of the ways to keep them in the business. Perhaps this is because my orientation as a music consumer is J-pop and my eyes are keen on the Oricon charts whenever my favorite artists drop a single or an album. I buy physical albums and DVDs online and have them delivered to me maybe because 1) I’m a sucker or a fool; 2) I’m a collector 3) I just like clicking that “buy” button and using my credit card. But since I got into CNBLUE, I had to learn to buy digital music, and I’m not even talking here of Digitalian. But seriously, music is not free. We don’t need to pay a premium to enjoy it but at least we have to contribute to the economy that sustains it. It’s the only way that our favorite artists earn a mileage to give us more music. No doubt that JYH has already earned his mileage as an artist, enough to release a solo album. He has been a prolific songwriter and composer for his band as well as for other artists. And thanks to him too, mileage may soon become a buzzword and by the sound of it, may end up as a slang (who needs a dictionary when you have YongDictionary but in the spirit of elucidation since I see a lot of questions about it on SNS, the conventional meaning of mileage is earning points or benefits i.e. airline miles etc; In YH’s song context, it’s YDG earning points from his wife to go on a boys’ night out). So yeah, you earn mileage for anything and everything in life, including making more music in the future. So JYH, here’s to more music mileage. P.S. For fun, when it was announced that Yonghwa will have four collaborations in his album, I made guesses. Below is the revised one but the original were: IU, YB, an FNC artist and a member of a male idol group. I changed to JJ Lin and YDG after friends reminded me. Well, that’s one check and three more guesses to go. We shall know in a few days’ time. I love Mileage and how it turned out. To be honest I was a little sceptical about the song when it was marketed to be hip hop as I was never quite into hip hop. However the song turned out to be anything but hip hop, with an easy breezy feel and a laugh-out-loud a minute MV. This is so Yong Hwa and I just love it. While the song comes across as fun and comical, actually the theme is about love for family and duty to the loved ones, which is so warm. I’m so happy that Yong Hwa is doing new stuff instead of just sticking to a safe Rock image, cos he is such a talented musician and should be free to explore and expand his musical journey. I’m looking forward to the rest of the album to see what other surprises he has in store for us. Sometimes, I wonder why those “rock elitists” are even Boice coz admit it, them boys have never been about heavy rock (that’s not to say they can’t handle it). anyway, haters will hate regardless. rock elitists? lol yeah much as CNB wants to be heavy rock, and they’ve talked about this in previous interviews, they can only do vicariously by watching their favorite hard rock bands. they don’t want to isolate majority of their audience. I really hope FNC releases a physical album! First, I really enjoy your writing style and comments, thanks for sharing them with us. Second, I agree with you that if we enjoy someone hard work, it is only fair to reward him for it by paying. and ,we know that Yonghwa works hard and God, I definitively enjoy it. I am so biased at this point that to be objective, I have to evaluate his and cnblue’s new songs in three layers: music ( I listen the sound with my eyes closed so that I am not influenced by his handsome face or funny antics), then I watch the mv and finally as you, I check the lyrics (I am a mexican fan with zero knowledge of korean language, so I have to wait for english/spanish trans) . I also like that the songs are across different genres since that provides me with songs for different moments: when I am melancholic, high or even when I want to say “go to hell” (monster ) so, for me, that is a win situation. Hola! thank you for reading and commenting. My observation with Kpop is there is a lot of freeloading going around. Maybe half or more than half of the fans don’t even bother to support their idols in ways that matter like actually buying their albums? Well sure, they are keyboard warriors clicking on YouTube and hashtagging for all it’s worth but at the end of the day, it’s the revenues that matter and would keep artists in business. As a friend said, the problem with Kpop, particularly those award shows is, it’s more hype over substance. And because of the hype, we actually think that these artists earn a lot and are able to live fabulous lives when the truth is, they earn a pittance for every record sold.